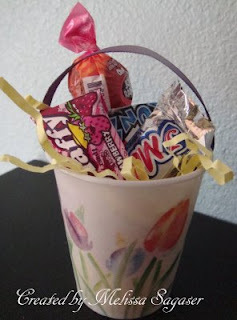 Do you make May Day baskets? We're making a handful for some close friends and neighbors this year. I came across some simple ones crafted with paper cups and ribbon, lace or strips of paper attached as handles. I was looking for something a little simpler than the typical cone style for Kirsten to be able to do them with me. Melissa Sagaser from Creative Treasures has some cute ones she made with flower patterned dixie cups, and scrapbook paper covered ones. I may make a few of those for her to take to daycare to share with her friends. I'd fill them with a box of yogurt covered raisins and some stickers and a flower. For our friends and neighbors though, I'm still partial to the paper cone style ones, decorated with ribbons, lace and filled with flowers. 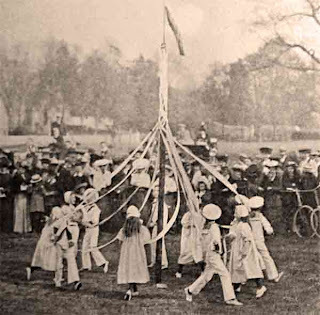 Too bad children don't still dance around a maypole in the US, such a sweet tradition gone. I still love this photo of all the may day baskets lining the fence. I'll be picking up paper this week to make some may day baskets with my daughter this week. We'll be making 9 baskets for neighbors and friends, and we'll make 12 cup ones for her friends and teachers at school. Would you like to make your own May Baskets? Here's the template I made a few years ago just for my readers. Clicking on it will bring up a hi-res version in Adobe PDF format for printing. If you'd like to make baskets with me and share a link to them in the comments I'd be delighted.